The impact of metastasis to the retropharyngeal lymph node group is poorly understood because of the difficult access to the retropharyngeal space (RPS). In 20%–50% of surgically treated oropharyngeal, hypopharyngeal, and cervical oesophageal carcinomas, we can find metastases to the retropharyngeal lymph nodes (RPLNs).1 The use of a three-dimensional (3D)-imaging-guided navigation system to perform a biopsy for a suspicion of metastasis in an RPLN can provide advantages in terms of better precision and 3D orientation with protection of the surrounding critical structures. 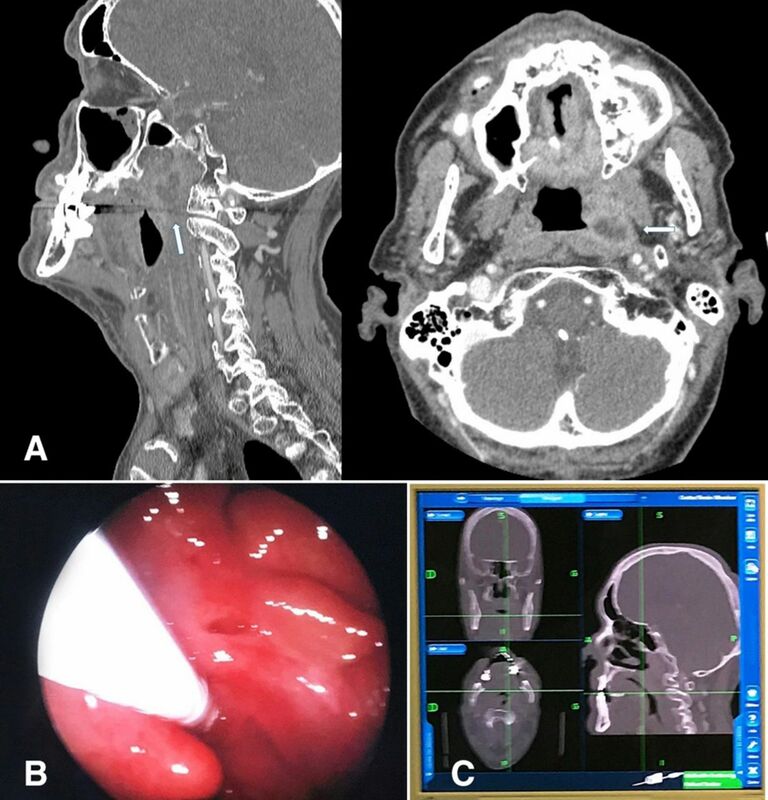 We report two cases of an open biopsy by transoral and transnasal approaches for a suspicion of metastasis in a retropharyngeal lymph node in two patients with oropharyngeal and pulmonary cancer, respectively, by using the 3D imaging-guided navigation system. In the both cases, the biopsies performed were very accurate and allowed to get a full histological analysis and diagnosis. The use of the navigation system as a means to perform biopsies in the soft tissue of the neck is rarely reported and up to date few reports can be found in the literature. This technique can provide multiple advantages when compared with other conventional methods. The procedure is simple, safe and minimally invasive. The radiological-guided transcutaneous biopsy of a retropharyngeal lymph node in head and neck cancers is generally very difficult due to a lack of precise orientation and the risk of damage to the critical nerves and vessels. Performing an open biopsy in the retropharyngeal space (RPS) via a transcervical approach after a neck dissection or radiotherapy is usually problematic with a high risk of complications. The use of a three-dimensional (3D)-imaging-guided navigation system to access the RPS can provide multiple advantages when compared with the other methods. We reported our experience regarding two clinical cases in using the navigation system to access the RPS. 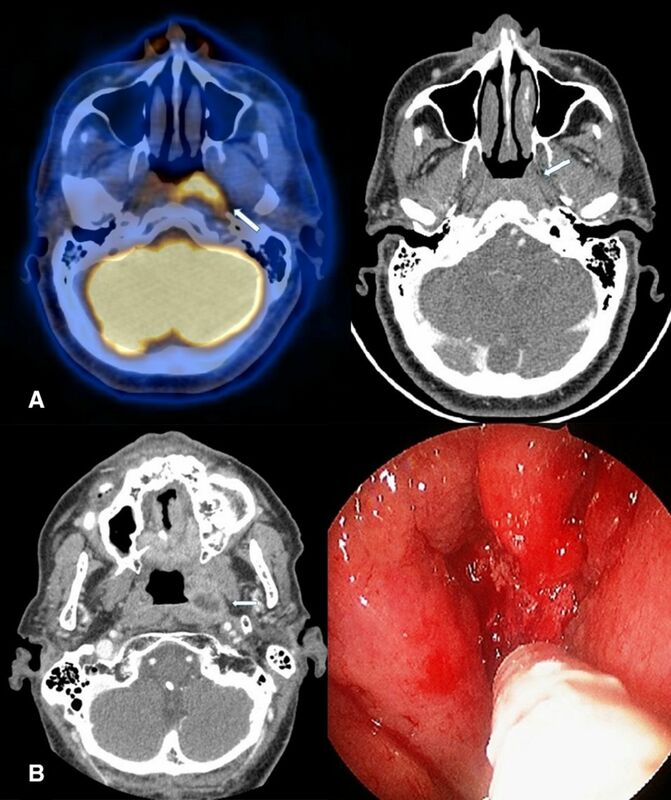 A 62-year-old man, active smoker was diagnosed with a left-sided oropharyngeal squamous cell carcinoma, initially staged as cT4a cN2c cM0 and underwent curative radiochemotherapy (70 Gy over 30 doses combined with weekly cisplatin). Follow-up by CT scan (figure 1A) at 6 months showed a submucosal necrotic mass of 1.8 cm in the RPS on the left side, suspect of a local recurrence, in contact with the internal carotid artery. The transcervical open approach or the radiological-guided transcutaneous biopsy was not possible to be performed because of the deep localisation of the masse in the RFS, the contact with the internal carotid artery and the important fibrosis related to the previous radiotherapy. A biopsy using a 3D-imaging-guided navigation system (Fusion ENT Navigation, Medtronic, Switzerland) was performed by transoral approach with a rigid endoscope of 0° (Karl Storz Endoscopy, Germany) (figure 1B). A high precision and very accurate 3D-anatomical orientation were obtained intraoperatively by using the navigation system, allowed to better localise the suspect lesion in the deep part of the RFS on the left side and to perform a direct biopsy without any accidental injury to the critical surrounding structures (figure 1C). Neither peroperative nor postoperative complications were observed. The histological analysis confirmed the diagnosis of metastasis of a squamous cell carcinoma. The patient received a palliative chemotherapy with carboplatin and erbitux. (A) Axial and sagittal CT scan views showing the suspicious necrotic and poorly defined mass in the retropharyngeal space (RFS) on the left side. (B) Endoscopic view shows the localisation of the mass and the performing of the biopsy. (C) The three-dimensional anatomical and accurate localisation of the mass in the RFS on the left side with the navigation system. A 71-year-old man, smoker was diagnosed with a pulmonary adenocarcinoma of the left inferior lobe, staged as cT2a cN0 cM0. A CT scan and positron emission tomography (PET)-CT (figure 2A) showed a suspicious and hypermetabolic left-sided retropharyngeal mass, at the level of the nasopharynx. The clinical examination with the fibroendoscopy showed an asymmetric left-posterolateral rhinopharyngeal wall without any exophytic or ulcerative lesion. The possibility of a rare metastasis of the pulmonary carcinoma to the retropharyngeal space or another synchronic tumour was suggested. The biopsy of the suspicious mass by using the transcervical or transcutaneous approaches was not possible because of the deep localisation of the mass, the difficulties to access the RFS at this level and the presence of a critical nerves and major vessels, espically the approximately with the internal carotid artery. The use of a 3D-imaging-guided navigation system to perform a biopsy of the suspicious mass in the RFS by a transnasal approach was very useful in terms of getting an intraoperatively 3D-anatomical orientation, very accurate localisation of the mass and a high protection of the critical surrounding structure (figure 2B), the biopsy was done with a complete safety without any complications The histological analysis showed an atypical lymphocytic hyperplasia without signs of malignancy. The patient was treated for his pulmonary carcinoma by primary surgery followed by adjuvant chemotherapy. (A) Axial CT scan and and positron emission tomography-CT fusion images showing a poorly defined and hypermetabolic mass in the retropharyngeal space, on the left side, at the level of the nasopharynx. (B) The accurate–anatomical localisation of the mass by using the navigation system, combined with the transnasal endoscopic approach. The follow-up 6 months after the palliative chemotherapy showed no local progression of the disease or appearance of a distant metastasis. No complications related to the surgical procedure were observed. The follow-up 6 months after the treatment of the pulmonary cancer showed no signs of local or regional recurrence or appearance of a distant metastasis. The use of a three-dimensional imaging-guided navigation system to perform a biopsy for a suspicious lymph node in the retropharyngeal space might be a helpful technique and can provide multiple advantages when compared with other conventional methods. Both transoral and transnasal approaches can be performed with the imaging-guided navigation system. The procedure is simple, safe, quick and minimally invasive.
. Tranoral videolaryngoscopic suegery with a navigation system for wxcision of a metastatic retropharyngeal lymph node. Karger AG, Basel. ORL 2014;76:357–63.
. Image-Guided Surgery in an occult neck metastasis. Wiley InterScience. Contributors BH: corresponding author, reporting. SVW: coauthor, acquisition of data. FB: coauthor, acquisition of data and design. SB: coauthor, reporting.